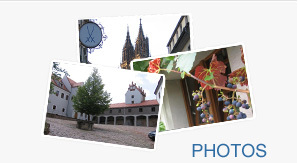 With a history dating back more than a thousand years, Meissen has long been known as the “cradle” of Saxony. That the town is worthy of such a name is clearly seen in its buildings – records of stone which bear witness to the different epochs of not only Saxon history but also the history of the Holy Roman Empire with Germany at its centre. This is manifest, for example, in the mighty ensemble of Albrechtsburg Castle and Meissen Cathedral on the hill above the town. With the romantic silhouette of the roofs of the Old Town below it, the hill offers a magnificent panorama and has become a favourite subject for photographers from the banks of the Elbe. Long ago, in the middle Ages, the Wettin Princes became the margraves of Meissen, thus marking the beginning of Saxon history. Albrechtsburg Castle is regarded as being the first castle to be used a royal residence in the German speaking world; built between 1472 and 1525, it is a fine example of late Gothic style. Today the castle, the former residence of the House of Wettin, is a museum which is just as popular with visitors as the cathedral, whose architecture is pure Gothic and whose Princes`Chapel is one of the most famous burial places of the Wettin family. Equally imposing is the view from the 57-metre high tower of the Frauenkirche (Church of Our Lady ), situated in the old market-place. From here, the visitor will be tempted to take a leisurely stroll through the narrow medieval streets, with their quiet squares and steep flights of steps, past century -old patrician houses which today accommodate small shops, cafes and wine cellars. This building, also well known as St. Afra Monastery, has a long history. St. Afra Monastery was founded in 1205 as an “Augustiner Chorherrenstift”. The monks and priests of St. Afra took care of the surrounding villages. After the reformation the „Fürsten- und Landesschule St. Afra“ was opened in 1543 and remained until 1942 in the former monastery. Gotthold Ephraim Lessing, the father of the German enlightenment, went to school here. From 1942 – 1992 the Monastery was used for different purposes. Since 1953 a “College for agriculture” was also situated here. In 1992 the EVANGELISCHE AKADEMIE MEISSEN – founded in 1949 – was relocated into these buildings. Since 1999 the „Pastoralkolleg“ is also situated here and since 2001 next to it the new „ Landesgymnasium St. Afra of Saxony“.